ABU DHABI - From Feb 14-21, the European Multi-Mission Frigate (FREMM) ITS Carlo Margottini will call at Abu Dhabi, United Arab Emirates, third stopover of her naval campaign in Middle East and Arabian Sea, aimed at ensuring presence and surveillance for the protection of sea lines of communication of national interest. 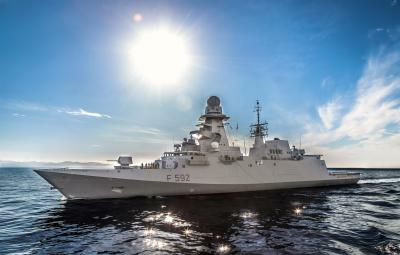 Fincantieri, Leonardo, MBDA and Elettronica, whose partnership with the Italian Navy and Defence contributed to the realisation of this campaign. ITS Margottini – which has participated in the international AMAN 2019 Exercise held in Pakistan – will take part in the Abu Dhabi Naval Defence Exhibition 2019 (NAVDEX 2019) in the framework of the International Maritime Defence Exhibition & Conference (IDEX 2019). This event will provide an opportunity to showcase our national Defence industry to an international audience and to strengthen cooperation and partnerships with key regional actors. The unit’s participation in IDEX-NAVDEX 2019 shows the Italian Navy’s concern with technological developments as well as its significant partnerships with the national industry for the design and production of advanced platforms and systems such as the FREMM units. After leaving Abu Dhabi, ITS Margottini will call at Dammam (Saudi Arabia), Kuwait City (Kuwait), Doha (Qatar) and Muscat (Oman). Media partners of the naval campaign are Rivista Italiana Difesa (RID), Report Difesa and Agenzia Nova.